This soup is my adaptation of Lidia Bastianich's recipe in [%bookLink code=1400040353 "Lidia’s Family Table"]; the addition of escarole was a suggestion from my co-worker Kathryn Yeomans. Meanwhile, spread chunks of bread on a large baking sheet and put in the oven. Toast the bread until it is dry and has turned a rich golden-brown. Bring 6 quarts water to a boil and add salt. Add escarole and parboil for 2 minutes. Drain escarole, reserving some of the cooking water. When the escarole has cooled, squeeze out the excess water. Drain the beans in a colander, picking out the garlic cloves and sage leaves and reserving the cooking liquid. Put 2 Tbsp. olive oil and sliced garlic cloves into a soup pot. Turn heat to medium low and sauté garlic until it begins to soften. Add the red pepper flakes and cook until the garlic turns lightly golden. Pour the bean cooking liquid into the soup pot and bring it to a boil. Simmer for 10 minutes. Add the bread and simmer it in the liquid until it absorbs the broth and softens. Turn the bread over several times so it doesn’t stick, but do not stir or break up the bread chunks. Add the beans and stir to mix. At this point the soup may be quite thick. Thin as needed with the escarole cooking water or plain water. Bring soup back to a simmer, and simmer gently until the soup is thick and soft. Add escarole and stir to mix. Serve with extra-virgin olive oil and freshly ground black pepper. 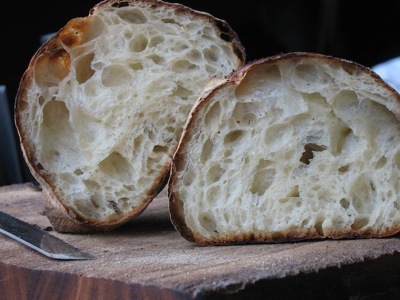 Read more of Kelly Myers' thoughts on repurposing old bread.